As our understanding of microbiological pathogens and their interaction with hosts expands, the complexity of assessing the risks posed by these hazards is also increasing. This is compounded by the extension of food production pathways, with multiple processes and/or new technologies used to produce the food that consumers desire. While based on principles developed for assessing toxicological and carcinogenic hazards, microbiological risk assessment throws up many challenges due to the ability of some microorganisms (bacteria) to multiply, or become inactivated, as food moves through the production to consumption continuum. In addition, microorganisms themselves are not static entities but are constantly changing through natural selection and exchange of genetic material. Food Standards Australia New Zealand’s (FSANZ) primary role in the food regulatory system is to develop food standards covering the composition and labelling of food sold in Australia and New Zealand and Australia-only food standards, including those that address food safety and primary production and processing. Food standards are a tool to facilitate the management of microbiological risks. FSANZ utilises the widely accepted framework of risk analysis1, which is a structured way of examining and incorporating the wide variety of factors that impact on a decision-making process. This framework – comprised of risk assessment, risk management and risk communication – is described in detail in the FSANZ publication Analysis of Food Related Health Risks2. The general risk assessment approach can be applied to the assessment of microbiological risks3. It is a structured process of organising and examining information to understand the interaction between microorganisms, foods and human illness. Its objective is to provide an overall statement of the nature (severity) and likelihood of harm resulting from human exposure to the hazard (bacterial, viral, protozoal, fungal organisms, or their metabolites) in food, and identify factors that may influence this risk throughout the supply chain. This information is used by decision makers to identify interventions that can lead to the greatest reduction in risk and provides a basis to weigh risk management options. Just as importantly, risk assessment can also help target research to fill data gaps that would have the greatest effect of reducing the level of uncertainty in the risk estimate. Risk assessments can be qualitative (descriptive analysis and/or categorical descriptions of risk such as ‘low’, ‘medium’ and high’) through to quantitative, which express risk in numerical terms (e.g. probability of illness per serve). Quantitative risk assessments involve mathematically describing the behaviour of microorganisms through the supply chain using the principles of predictive microbiology and combining with dose-response models to estimate the likelihood of illness at a given level of exposure. Quantitative assessments require extensive resources and expertise from multidisciplinary teams, however, the outputs can be extremely valuable to risk managers to quickly, and transparently, compare risk management options. Probabilistic risk assessments take this one step further and incorporate the underlying variability and uncertainty associated with model inputs, and describes the influence these have on the overall risk estimate. For example, this type of assessment was utilised by FSANZ for assessing the risk of illness from consumption of raw cow milk4. The type of risk assessment utilised is influenced by many factors, including the extent and availability of data, time and resources available, but most importantly the risk management question – that is, what information is required to make necessary risk management decisions. For example, during food safety incidents, a risk assessment may need to be completed in a short amount of time, with limited availability of data – therefore a quantitative microbiological risk assessment may not be feasible. In 2001, FSANZ was given the mandate to develop food standards that cover the whole supply chain, from paddock-to-plate (Chapter 4 of the Australian New Zealand Food Standards Code)5. In progressing the primary production and processing standards, FSANZ has been required to undertake a number of complex through-chain risk assessments for key commodity areas. These have included the seafood, poultry meat, dairy, egg and egg products, meat, and seed sprout industries and the associated reports are available on the FSANZ website (www.foodstandards.gov.au). 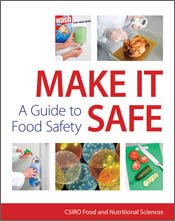 While primarily undertaken to inform the development of food standards, these risk assessments can also be a useful resource for the food industry when developing Hazard Analysis Critical Control Point (HACCP) food safety management systems, particularly for hazard analysis and determination of critical limits. While traditional risk assessments have considered single hazard:commodity pairs, these through-chain risk assessments often need to consider multiple hazards, across different production pathways, processes, and end products. As illustrated in Figure 1, this quickly increases the complexity of the assessment, with the ability of microbiological hazards to be introduced at each step of the supply chain (from animal, human and environmental sources) as well as increase or decrease in numbers due to potential growth and inactivation. Figure 1. Example primary production pathway. The changing environment in which assessing microbiological food safety hazards now occurs was exemplified in the outbreak of Escherichia coli O104:H4 in Europe in 2011. Over 3,800 cases of illness were notified to public health authorities in Germany, with 845 cases of HUS during the outbreak period of 1 May through 4 July 20116. Cases were also reported in up to 15 other countries, mostly in people who had travelled to northern Germany during the outbreak period. Following extensive epidemiological investigation by the authorities, seed sprouts were identified as the likely source of the outbreak. The detailed traceback investigations clearly illustrated the complex distribution of these types of food products at each stage of the supply chain (i.e. multiple seed suppliers, sprouters, food service, retail) and across many different countries7. This outbreak also exhibited quite a different epidemiological profile compared to previous outbreaks of Shiga-toxin producing E. coli (STEC). Rather than the high rates of HUS typically observed in children (predominantly seen for infections of serotype O157:H7), 88% of E. coli O104:H4 cases occurred in adults6. It is not clear if this changed profile was due to differences in host susceptibility or was representative of the exposure patterns (i.e. consumption of foods containing raw seed sprouts). The highly virulent E. coli O104:H4 was also unusual in that it had virulence features that were common to the enteroaggregative E. coli pathotype. It carried the gene for Shiga-toxin 2 variant (stx2a), however other genes typically observed in STEC such as stx1, eae and ehx were missing8. The exchange of virulence factors by means of horizontal gene transfer (e.g. prophage- and plasmid-mediated), and changing epidemiological profile for previously well-established hazards demonstrates the need for microbiological risk assessment to systematically collect and analyse all available information specific to the hazard and commodity in question, rather than making decisions on previous assumptions and experiences alone. As our understanding of the nature and behaviour of microorganisms in the environment and their interactions with the host increases, the tools available to undertake microbiological risk assessment have also evolved. There is a push for more quantitative assessments of microbiological risks, involving the application of predictive microbiology and mathematic modelling to describe the behaviour of microorganisms throughout the supply chain in an effort to determine the overall risk of causing human illness. As the complexities of microbiological risk assessment increase, there is also a desire for more user-friendly tools for risk managers/industry to utilise the outputs of risk assessment, such as the development of web-based tools (for example, those developed by FAO/WHO, which are available at http://www.mramodels.org/). FAO/WHO (2006) Food safety risk analysis – A guide for national food safety authorities, Food and Agriculture Organization/World Health Organization. FSANZ (2009) Analysis of food related health risks, Food Standards Australia New Zealand. Codex (1999) Principles and guidelines for the conduct of microbiological risk assessment, Codex Alimentarius Commission. FSANZ (2009) Microbiological risk assessment of raw cow milk, Food Standards Australia New Zealand. ANZFRMC (2001) Overarching Policy Guideline on Primary Production and Processing Standards, Australia and New Zealand Food Regulation Ministerial Council. Dr Duncan Craig is the Principal Microbiologist and manager of the Risk Assessment – Microbiology Section at Food Standards Australia New Zealand. His research interests are microbiological food safety and host-pathogen interactions.